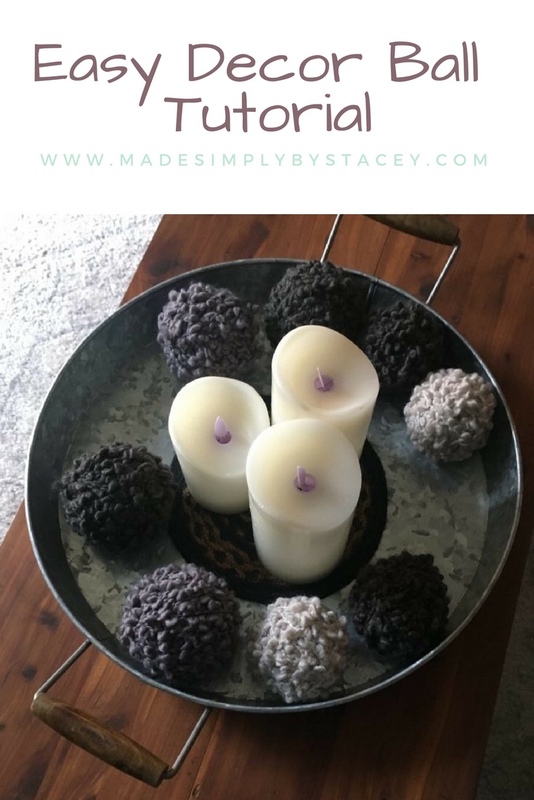 If you need a decor filler these easy decor balls are easy to make and add character to any room. They can be made in any size with whatever material you like. Foam Balls – I found these at Amazon. They come in different sizes so make sure you get the size you want. You can also use dollar store whiffle balls or plastic softballs. Hot glue gun – Get out your handy dandy hot glue gun. If you don’t have one, get one. They really are handy. Material – I used craft yarn. You can use yarn, jute thread, burlap, and twine. Glue around the outside of the ball, then wrap your material around it. Clip your material once you’ve covered the entire ball and fasten the end piece with more glue. Ta-da you have fabulous balls! They can be used for bowl fillers, basket fillers, or they can be used to add character to any additional decor. Or we can let the dog play with them. Okay, don’t let the dog play with them, that wouldn’t end well. Bless his cute little doggy heart. I love a good craft project, and these are so sweet. I’ll definitely be having a go at these. Thanks for the post! Such a cute and easy craft Stacey. I definitely would not let my daughters pup play with them, she can destroy the most expensive dog toy in no time. Simple yet great DIY project. I wouldn’t have thought of this one. Thanks for sharing! What a fun statement idea for décor! Love it. I like when crafts are cute without being intimidating to take on. What a great way to use up extra cute yarn! I love DIY home decor! These are so cute! These are so cool! Such a fun DIY, love this idea!